Founder of the Missionaries of Charity, Mother Teresa was an inspiration to countless millions for her lifelong devotion to the neediest and most vulnerable of the world. The selflessness and sacrifice with which she lived her own life made her an international symbol of charitable work, and the love and compassion she showed the destitute of all faiths won her a Nobel Peace Prize in 1979, which she donated entirely to the poor. Mother Teresa found her inspiration in Catholic teachings, but won widespread affection and admiration in her adopted home of Calcutta, India by respecting local customs and beliefs, and always placing our common humanity above religious divisions. 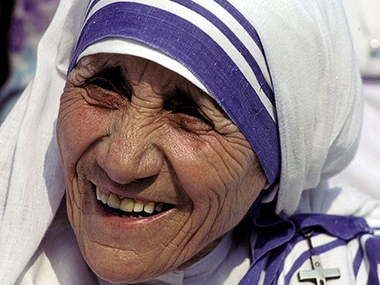 By 2013, the charitable organization she had set up, the Missionaries of Charity, had spread to 700 missions in 130 countries, providing soup kitchens, centers for family assistance, orphanages, schools, hospitals and homes for people with diseases such as leprosy, AIDS and tuberculosis. In 2016, Mother Teresa was canonized by the Roman Catholic Church as Saint Teresa. 1.Yesterday is gone. Tomorrow has not yet come. We have only today. Let us begin. 2.Peace begins with a smile. 3.The most terrible poverty is loneliness, and the feeling of being unloved. 4.What can you do to promote world peace? Go home and love your family. 5.I alone cannot change the world, but I can cast a stone across the waters to create many ripples. 6.God doesn’t require us to succeed, he only requires that you try. 7.Do not wait for leaders; do it alone, person to person. 8.Kind words can be short and easy to speak, but their echoes are truly endless.